While searching for some other petroglyphs in Natural Bridges National Monument a few weeks ago, Jackson and I climbed up and found this pictograph panel, which was an unexpected surprise. 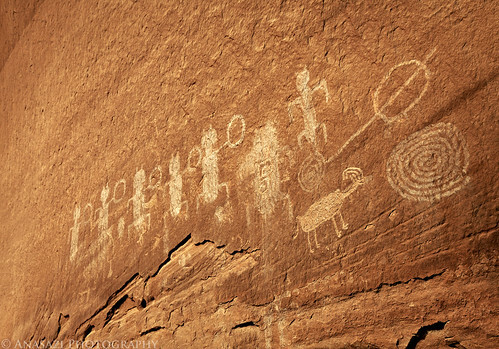 These white shield-bearing figures are painted over some old petroglyphs. Actually, while searching this area for more rock art we found plenty of very faint petroglyphs that didn’t photograph very well. When we first arrived at this site, the shadow of a nearby tree was casting it’s shadow on part of the panel. We stuck around until the shadow finally moved off the pictographs so that I could get a better photo. It was a nice find.